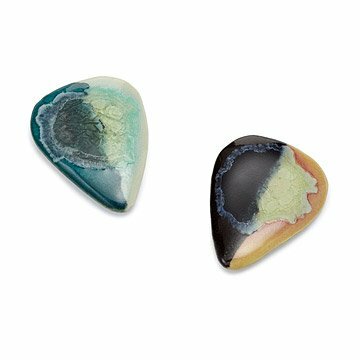 These unique guitar picks are made of recycled glass and stoneware. Harry Leaf's stoneware and recycled glass guitar picks combine the joy of music with the joy of using recycled materials for a more harmonious planet. The durably fired and glazed picks produce a unique sound along with their distinctive look. Sold separately. Handmade in San Francisco, CA. The pick came in very fast and it was beautifully crafted. However, I was surprised to see that only half of it was painted. One side was exceptionally detailed while the other was left as a blank stone. The picture in the description is very misleading...and there was nothing to explain only half of it was going to have something on it. The craftsmanship was beautiful as was a special surprise to learn from the background story on the package that the artist earned a law degree before pursuing his passion of art as my significant other did as well. I would buy this again. My niece loved it. Nice and solid for clumsy little fingers. Fast delivery and beautiful product! The pick is beautiful and unique! My friend loved it and is excited to use it. A great gift for a musician overall. The pick cannot be used in all guitars. Perfect gift for my grandson the musician! I bought this for a friend who has several guitars. The artwork of the piece is beautiful, however, it was too thick for the guitars that he has. Great gift, something the recipient can have fun with. Should have come packaged more carefully,easily could have been lost or broken loose with other items in large box. Bought this for my husband for Christmas. At first he thought it was a bit clunky but once he spent a few minutes playing with it he really liked it. Very unique.